Palestinian Authority president blasts Israel's 'occupation' as 'genocidal' during speech to European Union parliament. Palestinian Authority President Mahmoud Abbas railed against Israel during an address to the European Union parliament in Brussels on Thursday, slamming the Jewish state for committing “mass-murder”. The comments came hours after Abbas rebuffed efforts by EU President Martin Schultz to arrange a meeting between Abbas and Israeli President Reuven Rivlin. While Rivlin accepted the offer, after having received authorization from Prime Minister Binyamin Netanyahu, Abbas refused even a “brief meeting” with the Israeli leader. Abbas said that the Palestinians were suffering mass-murder on a scale never seen before in history. The Palestinian Authority leader called upon the European Union to take action against Israel, saying it had turned the PA into an “open-air prison”. “You are our friends, help us. Israel has turned our country into an open-air prison." Abbas claimed these were “black days” for the Palestinians, saying that the “tyranny and racism of the occupation” had worsened. He also demanded the immediate establishment of a Palestinian state with permanent borders, and threatened to continue efforts to “liberate Palestine”. 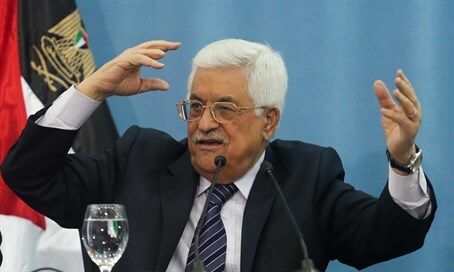 “Our right to self-determination is not up for negotiation,” said Abbas. “We are working to free ourselves from the occupation politically and diplomatically”.